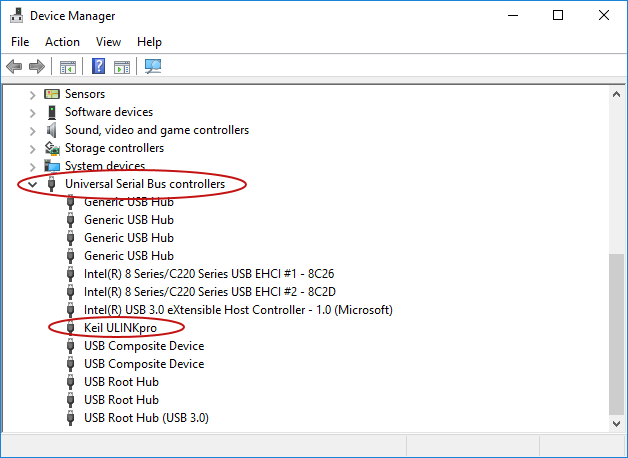 ULINKpro uses a specific Keil USB driver, which is part of the Keil tools. The Keil tools should be installed before ULINKpro is connected to the PC for the first time. Windows usually detects the new hardware and finds the corresponding drivers automatically. Open the Windows Device Manager (you may use devmgmt.msc in the command prompt or press the Windows-key and type Device Manager). Expand Universal Serial Bus controllers. One device should have the name Keil ULINKpro. Administrator rights are needed to open the Windows Device Manager. Subsequent connections to ULINKpro do not require new driver installations.